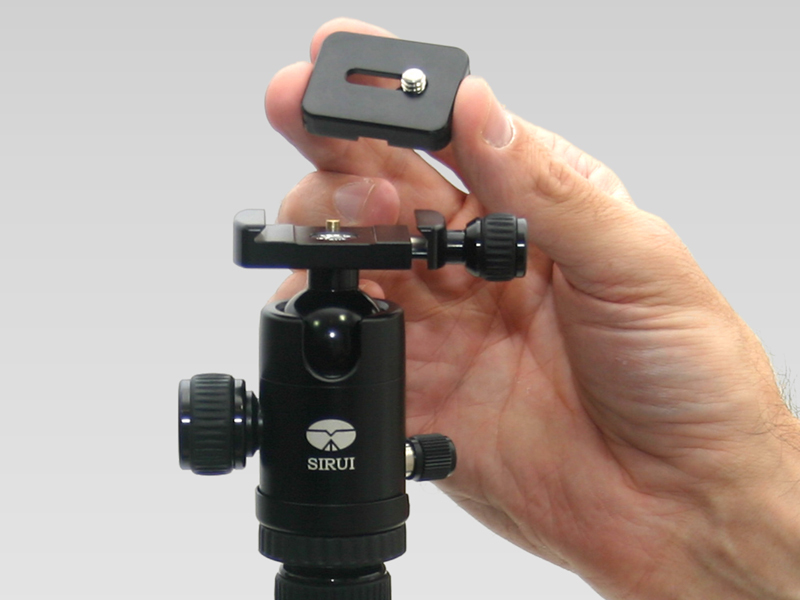 The Sirui tripod folds up to a very compact size. Recently while preparing for a trip to the Grand Canyon, I decided to re-evaluate the tripod I had been using for travel - a small Velbon DF Mini tripod. It was very compact and pretty light but it's maximum height is about 3 feet. When traveling, I generally leave my HDV camera at home - any video I shoot is shot with my Apple iPhone. As mentioned in the blog about Steadicam for the iPhone, my iPhone video camera support is accomplished with the Steadicam Smoothee for iPhone 4. 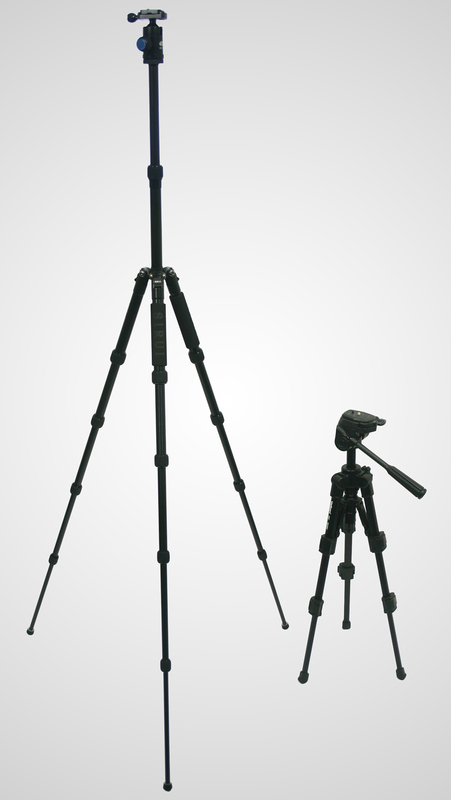 The tripod I was looking for was to support my digital SLR camera - the camera I use to shoot panoramic photos. I made a trip to my local camera equipment store - Hunt Photo in Melrose, and thought that a monopod may be the better solution for me. After discussing my needs with the technician, it was decided that a compact tripod was the best solution for shooting panoramas. 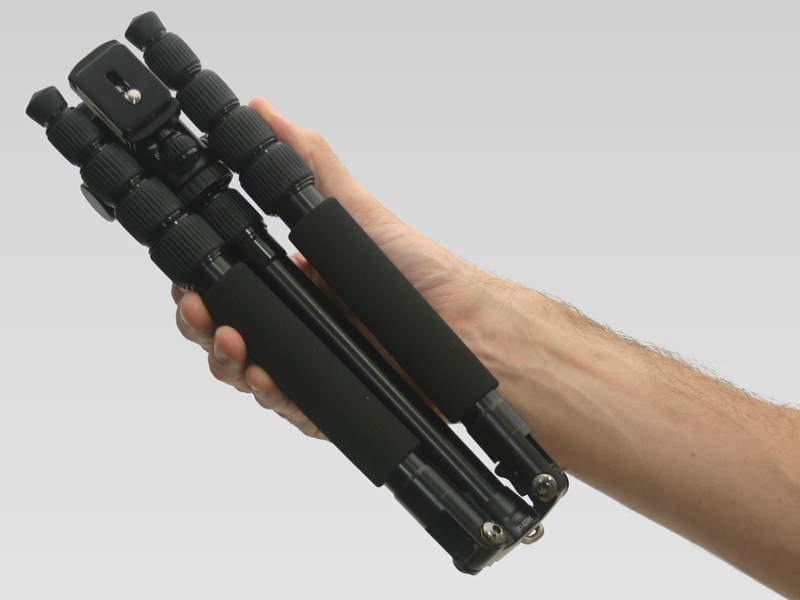 I ended up getting a Sirui T-005 5-Section Aluminum Tripod. At 11.8 inches folded and 2.2 pounds, it's more compact and lighter than my Velbon tripod. Better yet, it unfolds to be 54.4 inches tall, that means minimal leaning over when looking through the camera. It comes with a ballhead that can accept the quick release plates from most other brands. There's a retractable hook at the bottom of the center column to hang a weight (or your camera bag) for additional stability. The tripod comes with a soft bag that can be carried over your shoulder. The Sirui tripod quick release. I was able to give the tripod a full run-through while hiking in the Grand Canyon. It was the perfect size to slip into my pack. Setting the tripod up was easy, but it did require patience from my hiking companion as I set up the tripod, mounted the camera and took the series of shots I would later use to create the panorama. I was able to get the shots I needed for a series of panoramic pictures and was very happy I had it. An added bonus is that since the tripod can take up to 8 pounds, it can easily handle my HDV camera, a Sony HDR-FX7 HDV Camcorder.